This is one of my new low carb staple recipes. It’s a simple, but tasty beef broccoli recipe that whips up in minutes. I stock up on these ingredients in case I need to make dinner in a pinch. It’s simply perfect with your favorite salad. 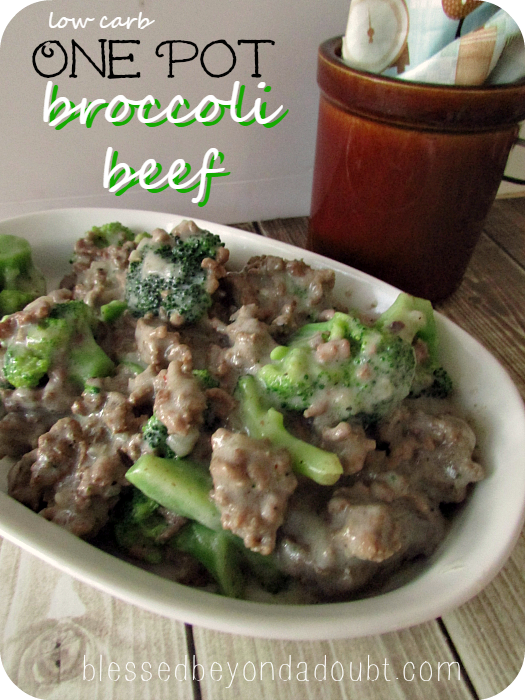 My kids love this simple low carb one pot broccoli beef dinner. You can go wrong with this easy and quick dinner either. Ground the beef in a big skillet with the seasoning, drain the fat. Add the broccoli and Alfredo sauce in the skillet. Cook until the broccoli is cooked. Serve with a salad. Sometimes I double the recipe and heat it up in the slow cooker for another simple meal. You will be serving a quick, but satisfying meal with this delicious beef broccoli recipe. Thank you for sharing this healthy recipe. Any idea how many carbs per serving? It will depend almost entirely on the particular brand of alfredo sauce you use. This would be real good with Cream of Mushroom soup instead of alfredo sauce. i would do this with the mushroom soup instead….sounds wonderful…. Just be mindful of the carb count in the cream soups. The recipe calls for alfredo sauce not cream soup. Tisa, is the measurements for seasoning suppose to be Tblsp or tsp? Really good recipe just need to pull back on the spices, for us. Thank you for sharing. Good recipe,but for Keto,maybe make your own sauce with a heavy cream, butter, garlic and pink salt, thicken and add some sour cream or cream cheese. Hi Marie, did you make your own sauce and if so do you have the recipe for it? Thanks! Oh my goodness! !.Thank you for this recipe.I love this.I just shared it with my daughter. You are very welcome. It’s a family favorite here too. I usually make my own sauces. I’m going to try just sour cream like beef stroganoff. Looks really good. I am going to make this soon! This sounds so easy and yummy!! Thanks for the great idea!! I will have to try this recipe next weekend. I’m having friends over and we always love trying new things. You got me at the alfredo sauce! Oh my goodness. My kids loved this! Yummy! This reminds me of hamburger gravy but with broccoli. I would serve it with some mashed potatoes. I can’t wait to try it. I know my husband will love it. I would love an Instant Pot or Pressure Cooker to try this recipe. This sounds delicious as well as healthy. My family loves broccoli. This recipe was absolutely delicious! I purchased a 2 lb. Pkg. of broccoli florets at Sam’s Club. I wanted to make sure and use it! My hubby and I are trying to decrease our carbs. I made this tonight with 1.12 lbs of ground beef and 2 jars of Bertolli Alfredo sauce. My seasoning had garlic, so I used 3 Tbs of it. I added a little bit of water, rinsing the jars of sauce. I cooked the broccoli per recipe. We loved it! I added red pepper flakes to mine. I passed the recipe along to my daughter. I’ll definitely be making it again. Thasnks for such a great recipe!